Andy Brown's taste in publishing is pretty spot-on for his Conundrum Press, even when it comes to lighter fare. 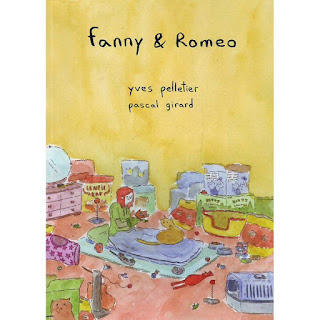 Yves Pelletier & Pascal Girard's Fanny & Romeo is in essence a romantic comedy that has a number of side-alleys, but the author-artist duo keep it from drifting into cliche' or sloppy sentiment. 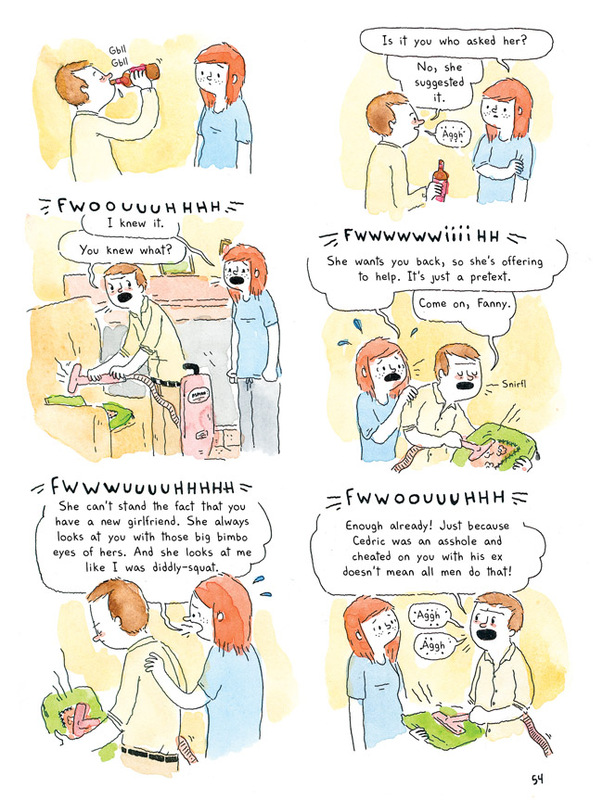 It's cute, to be sure, but never quite strays into being unbearably twee. In part, that's because the two leads in the story (Fanny and Fabien) are not entirely sympathetic throughout the book, even if there's frequently good reason for their mutual antagonism. These aren't two nice, perfect people who are led through a series of merry mix-ups and contrived conflicts in order to attach a spine of a plot to the book. Instead, these are two damaged, conflicted people who frequently act out in inappropriate ways as a means to avoid confronting their real problems. Fanny desperately wants to have a baby with her boyfriend Fabien. Fabien wants to wait until their lives are more stable--which is in some ways code for saying he wants her to be more stable as a person. When Fanny adopts a stray cat from a friend leaving the country, she instantly starts treating him like a person, as a sort of weird hybrid between boyfriend and child that sometimes happens when people substitute the affection of animals for humans. Fabien is allergic to the cat and gets sick around it (which Fanny blithely ignores much of the time), but he's also dismissive toward Fanny and doesn't respect her needs. Fabien grows increasingly frustrated when Fanny starts transferring all of her affection toward the cat, going as far as to rent a separate apartment for her to take care of the cat in. Pelletier does a nice job of playing up the sheer ridiculousness of Fanny's behavior while leaving a little room to offer some understanding of her desperate need to share love and receive it from her pet. Pelletier also notes that Fanny's stubborn need to have the cat forces her to grow up and put her talents as a graphic designer to real use. One of the big themes in the book is infidelity. Fanny's old boyfriend cheated on her (and she similarly was unable to get him to have kids--something that immediately changed with his new girlfriend's pregnancy), and she constantly suspects Fabien of stepping out on her as well. Just as her old boyfriend didn't want to have a kid with her, she sees Fabien inevitably following in his footsteps in other ways and seeing other women -- and his old girlfriend Kim in particular. Fanny's success and ability to cope while being alone is only heightened when she discovers that her cat isn't exactly faithful to her, either, as she is shocked to learn that the cat really belongs to a whole other family. The book ends with a reunion that while a bit soapy, is totally earned on the part of Fanny and mostly believable on the part of Fabien. Girard is really at his best here, channeling his inner Joann Sfar in the way he draws animals and uses color to flesh out characters' emotional states. The simplicity and clarity of his slightly ragged line matched with the softness of the watercolors adds a lot of restraint to the proceedings, whereas a more cutesy approach with digital color might have made the book unbearable. 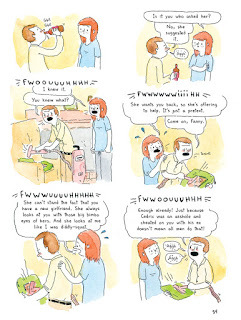 Instead, it's a clever, cute and entertaining book with some wise observations folded into the silly scenarios. 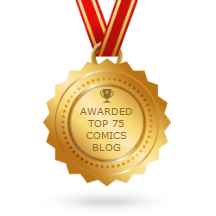 It's a lightweight bit of fun that is firmly in the camp of what Kim Thompson once referred to as "good crap": stories aimed at a mainstream audience that are solidly constructed, entertaining and fun to look at.